This book looks at the inner civil war and its aftermath. 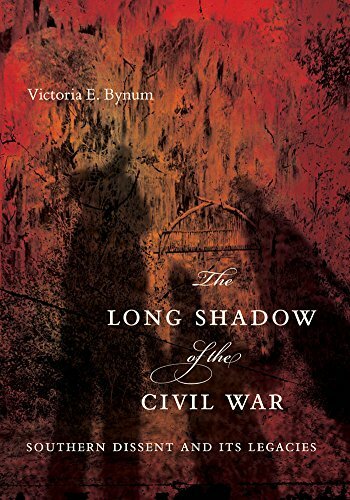 In ""The Long Shadow of the Civil War"", Victoria Bynum relates uncommon narratives about common Southern folks who fought not with the Confederacy, but against it. Focusing on regions in three Southern states - North Carolina, Mississippi, and Texas - Bynum introduces Unionist supporters, guerrilla soldiers, defiant women, socialists, populists, free blacks, and large interracial kin groups that belie stereotypes of the South and of Southerners as uniformly supportive of the Confederate cause. Examining regions within the South where the inner civil wars of deadly physical conflict and intense political debate continued well into the era of Reconstruction and beyond, Bynum explores three central questions. How prevalent was support for the Union among ordinary Southerners during the Civil War? How did Southern Unionists and freedpeople experience both the Union's victory and the emancipation of slaves during and after Reconstruction? And what were the legacies of the Civil War - and Reconstruction - for relations among classes and races and between the sexes, both then and now? Centered on the concepts of place, family, and community, Bynum's insightful and carefully documented work effectively counters the idea of a unified South caught in the grip of the Lost Cause.